A Malay daily recently declared that a civil war would break out in the country. And this war would dwarf the May 13 1969 racial riot – the worst in Malaysia’s history. The war, said the newspaper, is a response to a non-existing amended constitution that abolishes the special position of the Malays and Islam. Deputy Prime Minister Muhyiddin Yassin also made reference to the 1969 riot in his comment when he reminded his Barisan Nasional (BN) colleague, Dr Chua Soi Lek, to tone down his demands to scrap what the government likes to call the pro-Malay economic policy. In Penang, we heard stories that the name of the Yang di-Pertuan Agong has been replaced with Penang Chief Minister Lim Guan Eng in Friday sermons in some mosques in the state. Apart from some Umno leaders who are fond of making racist comments, we also now have Perkasa which claimed to champion the constitutional position of the Malays. These stories have been reported at length and front-paged by many newspapers, inviting discussions from both sides of the political divide. These stories are not new. Many of us have heard similar stories not too long ago. Remember in 1987 when Umno organised a racially charged political rally? It was followed by detention of many opposition leaders, including Karpal Singh and Guan Eng, under Operasi Lalang. I wonder what the people behind the recent racial provocations hope to achieve. I was too young to remember Operasi Lalang, but from my understanding of the event, it sounds so similar to the political theatre we are watching right now. Every now and then, Malaysians are forced to watch the show based on an outdated script, written perhaps by those in power who benefit from racial polarisation. Except for the change in the cast, the script always revolves around racial hatred, and how one community is a threat to another community’s interest. Thank God, this latest show has not resulted in a new racial riot, or the “great war” that the Malay daily was trying to instigate. Obviously, this tactic has not worked with Malaysians. Young Malaysians now demand a new script for the nation to be written by them. In saying that the latest attempt at disuniting the country has failed, I am not entirely dismissing the fact that the racial rhetoric might have attracted some groups of young Malaysians. Reading reports on Perkasa activities, I noticed the presence of a small number of young Malays. These are the people that I wish to reach out and to join other young Malaysians to write a new script for the nation. Perkasa has been accused of only trying to defend rent-seeking activities, but I doubt these youths are awarded any government contract. My suspicion is they have been indoctrinated with years of racist propaganda. They are not alone. I have heard of civil servants and even teachers who made racist remarks while on the job. But I have not given up on them. I want to tell them that it is not hard to look beyond the colour of our skin, to understand that diversity has always been the foundation of this country. I would like for all of us to focus on the real issues that will destroy this country: such as corruption, low foreign investment, lack of job opportunities and many other problems shared by all Malaysians. It would not be easy to make them understand, but the success of the new script for Malaysia’s future depends on not just one group but also others who have been misled and marginalised. That is why all Malaysians must speak out and decide once and for all what the new script would be. A script built on the promise and vision of an independent Malaysia for all citizens: based on the rule of law, justice and equality. Those who deny the will of the people for a better Malaysia should take note. Malaysians recognise theatre as it is, and the days of political theatre are over. 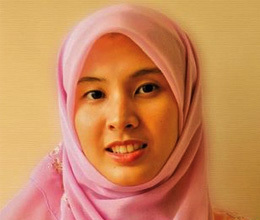 Nurul Izzah Anwar is PKR's MP for Lembah Pantai. The important thing is to ensure that her message reaches out to the right people. Well said & this should be the agenda that we focus on, not some racial politic games. Can only concur on this article but there also is another serious ethical issue by where you stand that must be addressed with right minded action towards setting a continuing precedent where Tok Guru's son-in-law Abdul Ariffahmi Abdul Rahman left off at PMBK. Do not fear to be forgotten or to 'lose power' by letting another fellow citizen take your MP's post, you and all of us are citizens and EQUALS, and you would be greater for setting a precedent to prevent Conflict of Interest via fiefdoms of relatives (setting base for hereditary Oligarchies in parliament) in the manner Tok Guru demanded of his son -in-law Abdul Ariffahmi Abdul Rahman to quit the PMBK post to prevent Conflict of Interest. Do the right thing, set the right example and teach others to do the same. This is righteous in the eyes of Allah.